This trip to paradise was a long-time dream...a place that I always said we would go once we retired and felt we deserved the “splurge”. And so, now that both of us are retired, the time had finally come!!! There was a lot to live up to since I had been daydreaming of this place for so long...and it did not disappoint! When people say “tropical paradise” THIS is what they mean!! 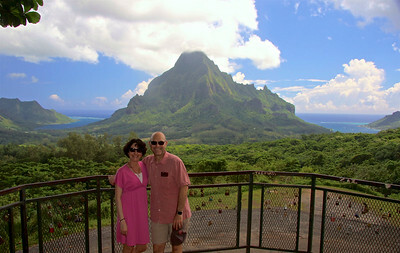 We spent 12 nights on 4 different islands to get a good taste of what French Polynesia has to offer. 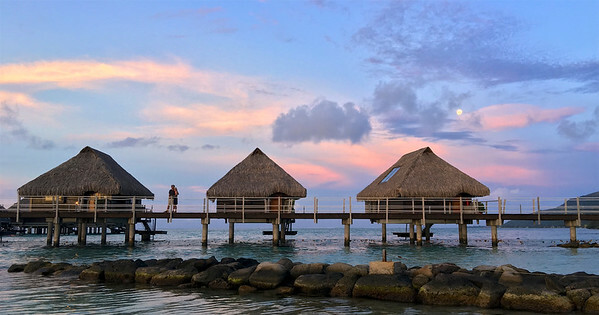 French Polynesia is divided into five groups of islands: The Society Islands, the Tuamotu Archipelago, the Gambier Islands, the Marquesas Islands and the Austral Islands. 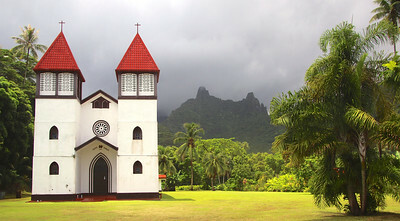 Tahiti, in the Society Islands, is the largest, most populated island. It is the one most people have heard of but it’s actually not nearly as beautiful as some of the other islands and therefore serves more as a travel hub since all the international flights arrive and depart from there. We arrived in Tahiti and immediately made our way to its closest neighboring island, Mo’orea (11 miles northwest), for 3 glorious nights. 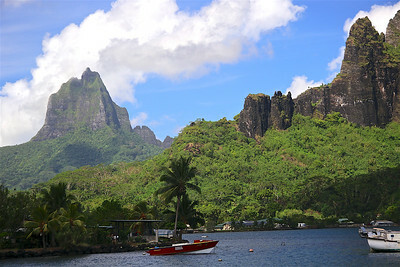 Mo’orea’s scenic bays nestled amongst verdant, spiked mountains are what make it so alluring. 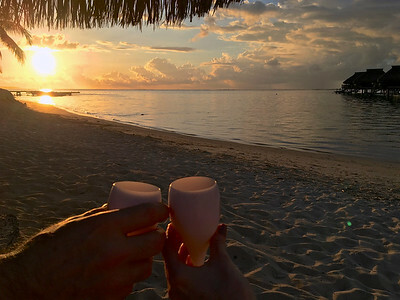 We rented a car one day and drove the 36 mile round-island road and spent the rest of our time soaking in the ambiance, as one should, with a libation in hand on the beach...BLISS! 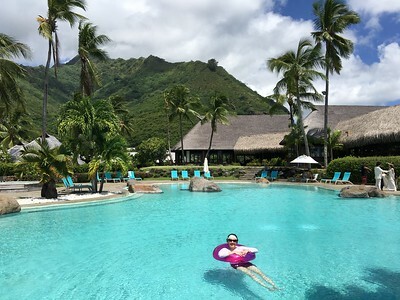 Located about 143 miles northwest of Tahiti, Bora Bora is surrounded by a lagoon and a barrier reef. In the center of the island are the remnants of an extinct volcano rising to two peaks, Mt. Pahia and Mt. Otemanu, the highest point at 2,385 feet. 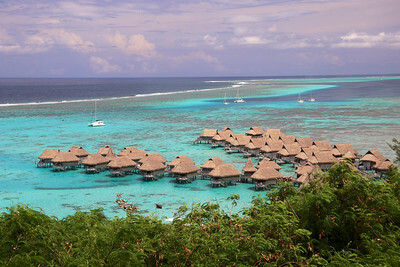 This dramatic geography is what sets Bora Bora apart from any place we have ever seen before! The scenery is quite literally breathtaking! At first look, you just gasp...you cannot believe the beauty in front of you! 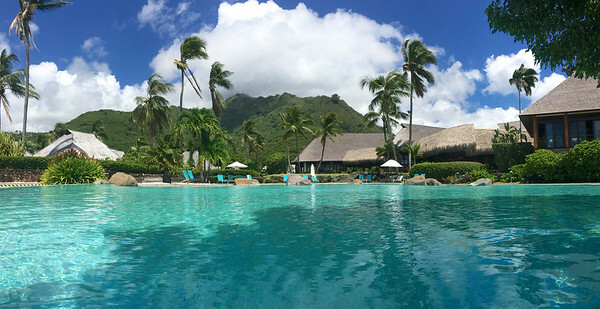 But the thing that makes this place so unique and so stunning is the combination of the lush, green, jagged mountains, the unbelievably azure blue water and the fact that your “home” is a bungalow on stilts sitting in the lagoon. It’s like you are suspended above heaven! We spent 4 nights at the impeccable St. Regis Resort. There aren’t enough adjectives for me to describe how much I loved it here! It truly was beyond everything I imagined it to be! After tearing ourselves away from Bora Bora we flew to an atoll in the Tuamotu Archipelago called Rangiroa (about 213 miles northeast of Tahiti). Here on this secluded coral atoll, there are no soaring mountain peaks or sweeping valleys characteristic of the other islands. Instead, flattened islets and skinny sandbars encircle the perimeter of Rangiroa’s vast blue lagoon. There are 2 passes joining the lagoon to the open ocean, Avatoru Pass and Tiputa Pass, which produce currents that are ideal for drift diving. We spent 4 nights here and went scuba diving each day. We saw countless black tip sharks, and even a hammerhead shark! We were delighted by turtles, stingrays, eels, and countless colorful fish and vivid coral. We spent our last night in Tahiti before our early morning flight back to reality. But our time here in this paradise left me with an intoxicating feel of euphoria that I will never forget! We have been lucky enough to have seen many parts of the world and rarely ever go to a place twice because there are just too many amazing places still to see...however…Bora Bora is already calling me back! 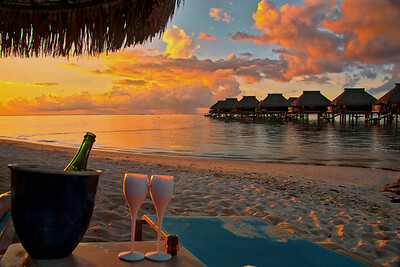 I read somewhere that “Bora Bora is one of the few places on earth that everyone hopes to witness in their lifetime”. Well, I feel so very fortunate, not only that I was able to experience this magical place at all, but with my best friend. And we will treasure the memories we made forever! 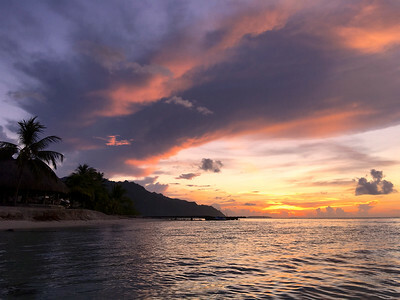 Sunrise at the Hilton Mo'orea I had the beach all to myself. The serenity was sublime! 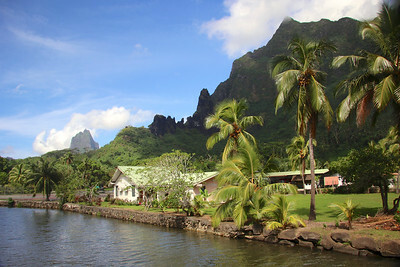 Like many of the other islands, Mo'orea was first settled by Polynesians from the islands west of Mo'orea. They arrived on canoes coming down from South Asia looking for islands to settle. 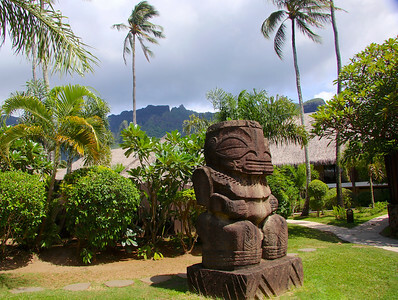 It is estimated that they arrived on Mo'orea roughly 1000 years ago. 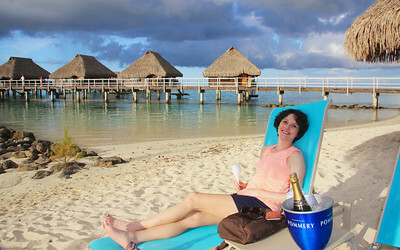 How we spent much of our time at the Hilton Mo'orea....ahhhhhh!